A native California flower with ferny foliage and lavender blue globe flowers that act as beacons to bees and butterflies. Provide well-drained soils. Lovely with godetia and linaria in the early summer garden. Also called Blue Thimble Flower. 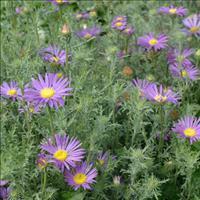 Also called Tahoka daisy, this cousin of aster is native to Texas. Its lovely finely cut foliage is aromatic of pine, and develops a bushy branched habit and a carpeting of lavender daisy flowers early summer to fall in moderate, drier summer areas. Provide fertile, sharply well-drained alkaline soils and sow early when it’s still cold, fall in southern regions.